We all know what burglars are, and it’s fair to say that nobody wants them anywhere near their homes. However, many of us seem to overlook the fact that 50% of burglars live within a 2 mile radius of the homes they invade. You should also be aware that a burglar may have already stepped into your home at some point, either when they were repairing your toilet or delivering a package. 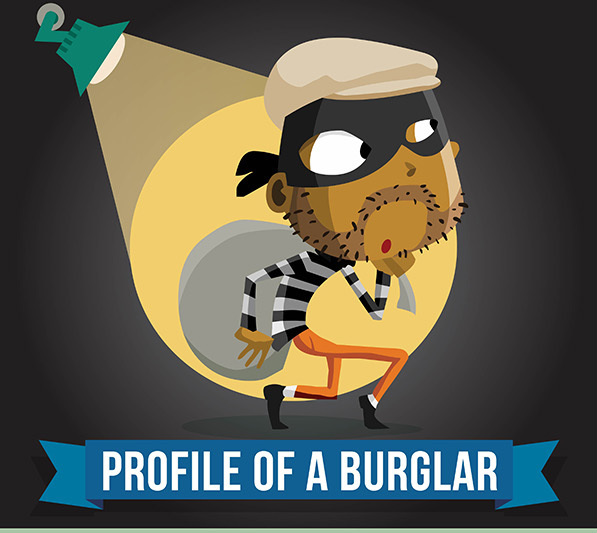 In order to protect your home and more importantly, your family, check out our infographic to get the breakdown of what you should expect from your typical burglar. A self contained electronic OC Anti Burglar System –no wiring needed! Using a passive infrared detection system, a single Burglar Blaster unit can control areas up to 2,000 square feet. When triggered, the unit releases four ounces of irritating OC pepper spray, to stop an intruder in seconds. The Burglar Blaster can be installed in minutes with no electrical experience required.